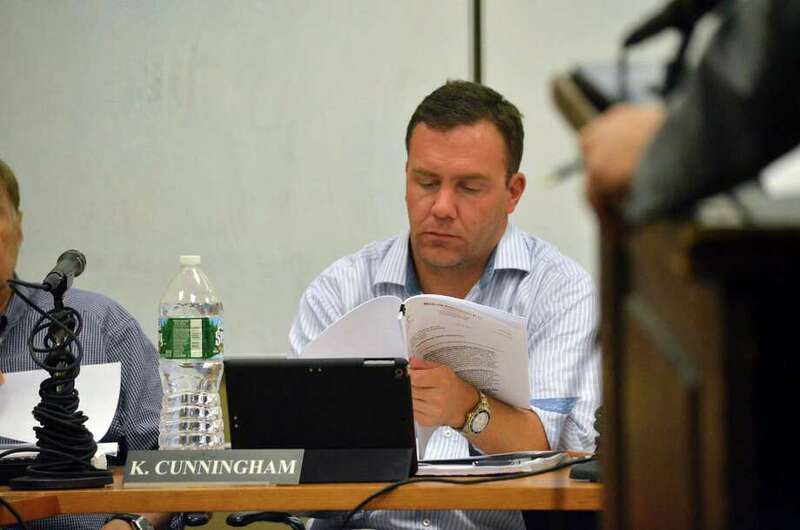 Planning and Zoning Commissioner Kevin Cunningham looked over documents pertaining to the proposed regulation change for senior housing. The attorney representing an applicant seeking to pave the way for senior housing returned to the Planning and Zoning Commission Tuesday to answer questions posed following a public hearing two weeks ago. Robert Maslan, representing Penelope Glassmeyer, modified the original application after the June 25 meeting to make it more specific. The proposed units would each have a maximum square footage of 3,000 feet and each home in the "empty-nester" zone would have a height maximum of 30 feet and two stories, Maslan said. Residents would have to be age 62 or older to be eligible. "My reasoning (for the building constraints) is you don't want houses in this area that look like they're three levels," Maslan told the commission. Some of the commission's questions dealt with open space and expanding the regulation amendment to the rest of town. The commission will continue discussion of the proposed amendment to allow an empty-nester and senior housing overlay zone at its meeting next week. The application is a proposed amendment to the town's R-1 Residence Zone, which would allow multi-family, age-restricted developments in some 1-acre-zoned locations throughout town. Glassmeyer, who owns 40 Locust Hill Road, wants to build seven units of affordable housing for seniors on her 3-acre property. Maslan told the commission that there are roughly 10 other sites where the empty-nester overlay zone could apply, including the Zeigler property on Long Neck Point Road; 203 Long Neck Point Road, which is 3 acres and the former site of Firwood, which was demolished before the property was put back on the market; and 108 Long Neck Point Road, which is 7 acres. No residents spoke about the application Tuesday. Several residents spoke out against the application during the first public hearing session, saying the construction of the senior housing would disrupt the character of the neighborhood and the area isn't conducive to senior living. The public hearing was continued to 8 p.m. Tuesday at Town Hall.